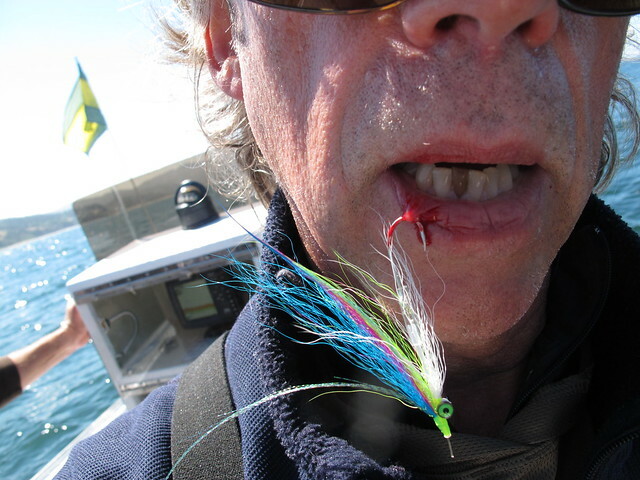 however, the lesson is NOT related to casting, the lesson is that one should not hold a fly in their mouth while leaving fly line laying in the bottom of the boat, lest one’s fishing buddy gets his feet tangled in the line and stumbles around, jerking vigorously on the line to get it free…. Geeez. Way to screw up a cool fly Jay. You have a lot of friends who are going to save this picture for a long time. Another argument for barbless. Get well soon. Havent seen anything so pathetic since one of my rams caught his business in the electric fence. That ll be a smart walk into the clinic. Save the fly man! Another excellent reason to use barbless and keep one’s tetanus booster up to date (~ 10yr). A nice pair of diagonal cutters can be a blessing when needed.